Volt Casino might not be a household name to some players but in the few years that they’ve been around they’ve managed to turn a few heads due to their quality online gambling platform. Their casino has been on the steady rise and they decided to try their hands at sports betting to give their players even more to do, under one roof. 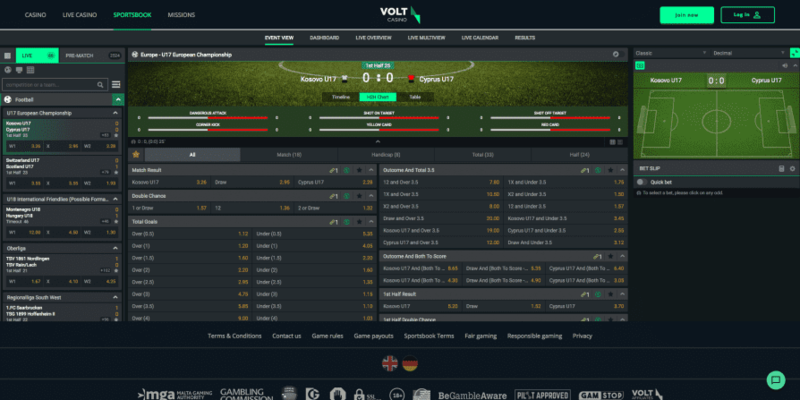 We always like to recommend sportsbooks that have something exciting and different to offer their players and this is exactly what VoltCasino brings to the plate. The layout used at Volt Casino’s sportsbook is tidy to look at and you never feel as though the page is cluttered. There’re no adverts taking up real estate on the page, so what you see is what you get. Volt have placed their logo in the centre of the page, at the top, and to the left of this is a menu which you can use to navigate to their casino, live casino, missions and sportsbook sections. On the other side of the page is where players can log into their accounts and new players are able to sign up. Beneath the menu at the top of the page is a smaller menu which is specific to the sports section and here is where you’ll find links to the event viewer, dashboard, live sports overview, Multiview, results and calendar. Over on the right side of the page is where players will locate their betslip. This will tally up all bets you add to it and calculate how much you could potentially earn if all were to win. On the opposite side of the page is where you’ll find the complete list of sports offered to players, at VoltCasino Sports. At the very bottom of the page is where you’ll find the different payment methods, as well as information regarding the various sections, including mobile betting, T&C’s, rules, privacy, contact us and an option to change the language between English and German. We always like to see a good selection of betting markets when evaluating a new sportsbook. Whilst VoltCasino doesn’t have the most extensive list, they still have a good range of sports available for you to bet on. These include Football, Basketball, Ice Hockey, Table Tennis, American Football, MMA, Boxing, Politics, Snooker, Field Hockey, Biathlon, Special Bets, League of Legends, Hearthstone, Starcraft, Overwatch, Chess, Cycling, Squash, Rugby League, Floorball, Golf, Motorbikes, Surfing, TV Shows & Movies, Cross-Country Skiing, Alpine Skiing, Netball, Trotting, Ski Jumping, Auto Racing, Oscar, Water Polo, Nascar, Hurling, Gaelic Football, Rugby Union, E-Football, Darts, Cricket, Rocket League, Starcraft 2, Heroes of the Storm, CS:GO, Dota 2, Bowls, Aussie Rules, Bandy, Badminton, Formula 1, MMA, Futsal, Handball, Baseball, Volleyball and Tennis. Unfortunately, there’s nothing for new or existing players to claim as a welcome bonus at this point. Although this is disappointing, we do expect VoltCasino to address this in the near future. If you’re interested in heading over to their casino site, you’ll be able to claim up to 120 wager-free spins when you deposit £20 or more into your account. This is great for players who are looking to try out Volt’s renowned online casino. This is something which has taken off in recent years and nearly everyone at this point has or has access to a mobile phone. Volt Casino are aware of this and this is why they’ve fully integrated their sportsbook to work from your mobile or tablet. There’s zero quality loss by choosing to play from your mobile device instead of a desktop, so you can be assured that VoltCasino’s sportsbook is just as good on the small screen, as it is on the big screen. To begin betting during play, all you need to do is head to the sports list down the left side of the page and click “Live”. This will then display the various sports and competitions that are happening live, in real time and you can choose the sport and match you’re looking for to then make a real money bet on it. The sports you’ll find are Football, Tennis, Basketball, Volleyball, Ice Hockey, Baseball, Table Tennis, Badminton and Snooker. There’s also a bunch of eSports, such as King of Glory, E-Football, E-Basketball, E-Tennis and Mortal Kombat XL. These sports update depending on what’s live. Having a great help and support system is important these days, as it means that if you were to encounter a problem, you can get it resolved quickly and promptly. Volt Casino offers their players a few different ways in which they can get in touch with a representative, including live chat and email. If you have a question or are interested in knowing something, you can always refer to the FAQ guide that VoltCasino offers. This is a detailed section that is compiled with questions and respective answers to previously asked questions. When choosing a new sportsbook, players should be aware of the different payment methods that they accept. This is to prevent any issues should you wish to use something more suitable. Volt Casino offers a few different payment options for player, ranging from banking methods like Visa and MasterCard, to e-wallets like Neteller, Skrill, Trustly, Klarna, EcoPayz and Paysafe Card. Volt Casino is ticking some of the right boxes and players who’re looking for somewhere new to play. It’s not perfect by any means and the fact that they don’t have a welcome bonus is particularly disappointing. We hope that this is something that they address in the near future, whether it’s just a free bet or a matched deposit bonus, something is better than nothing. Moving onto the good, we have a decent array of markets which have good odds, and these are very accessible. The customer support is efficient when dealing with problems, so you won’t find yourself waiting around for long with any issues or questions that you might have. The fact that they’ve fully optimised their site to work from yourmobile device is a nice implementation that we did expect, but we are happy it happened. This means you can truly experience all the cutting edge sports betting aspects but away from your computer or anywhere in the world, so long as you have a stable internet connection.